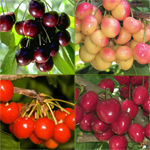 Cherries are one of the easiest fruit trees to grow. Your 4-in-1 Cherry is self-pollinating, so you don't need a second tree. You get a bearing age tree that is several years old. The four popular varieties were carefully selected to grow well together. Third generation fruit tree growers have perfected this tree over the decades. Continuously pruned branches give you more cherries at a safe picking height. These thicker branches can mean up to twice the fruit as a normal tree. Fertilize in spring with an all purpose fertilizer before new growth begins. Proper pruning is a must for a combo but is not necessary for the first few years after planting your tree. Most people prune them back to keep a shorter tree. Take care not to get too close to the graft, prune dead or spindly branches. When fruit begins to ripen protect from birds by placing a thin net over the tree.